Chelsea are hunting for the ‘new Didier Drogba’ as they prepare for the potential departure of the Ivorian striker when his contract expires at the end of the season and one name that has been said to be the ideal replacement for Drogba is Nigeria International, Brown Ideye. 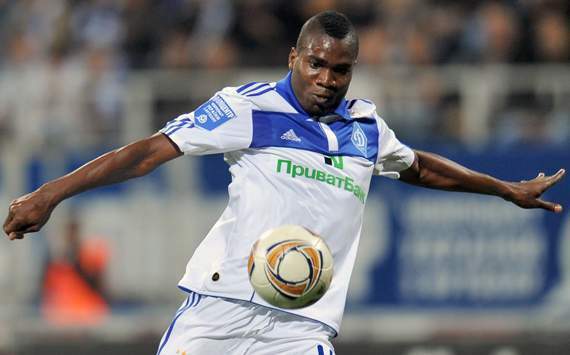 Dinamo Kiev star Ideye Brown is one forward who has attracted attention from Chelsea after scoring 12 goals in 24 league appearances for the Ukrainian side this season following his move from Sochaux last summer. Representatives of the 23-year-old Nigeria international were in London last weekend and are understood to have held talks with senior Chelsea officials including chief executive Ron Gourlay before the Blues’ win over Wigan on Saturday. Brown, who would cost around £10 million, has been compared to Drogba because of his powerful running and finishing ability and his arrival would raise doubts over the future of Romelu Lukaku. Lukaku, 18, has made just six Premier League appearances this season and is believed to be concerned about his lack of first-team opportunities since joining from Anderlecht last summer in a deal worth an initial £13 million.